There are many supplements out there promising to make you look younger, but what are the best supplements for aging skin? I did the research to come back to you with a list of some of the best supplements for aging skin on the market today. All of which have proven results, and won’t break the bank either. Believe it or not, in addition to a healthy dose of SPF 30 sunscreen, you may be able to protect your skin from UV radiation all year round with a fern extract supplement called polypodium leucotomos (cabbage palm fern). According to research from the University of Miami School of Medicine, supplements containing fern extract may reduce DNA damage caused by UV radiation, which can help prevent wrinkles and brown spots on the skin. For best results, it’s recommended to take one of these supplements each day. If you’re planning a sun-filled vacation, start taking these supplements at least one week prior because it allows the antioxidants to build up in the system. The studies were done in only a small number of people and further research is necessary but preliminary results are promising. 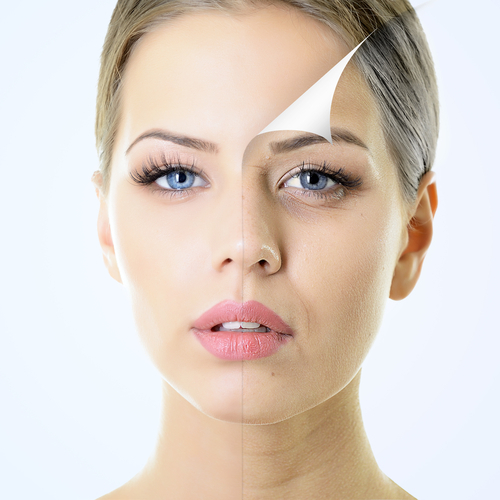 A supplement called idebenone is known for producing younger looking skin. It’s an antioxidant similar to Co Q10 and may repair damaged skin cells. According to Dr. David McDaniel of Eastern Virginia Medical School, taking these supplements daily may protect your skin from the inside out. To improve the firmness and smoothness of your skin, try a supplement called Imedeen Prime Renewal. It is a biomarine-based complex with a proven reputation, recommended for women aged 50 and up. In a 6-month study in the European Journal of Clinical Nutrition, postmenopausal women saw drastic improvements in skin firmness and smoothness. In a similar 12-week study on women taking a sister supplement, results showed that skin’s moisture content increased by 30%. In addition, there was a visible reduction in fine lines, a fading of sunspots, and brighter overall complexion. According to Imedeen’s Lars Lindmark, PhD, the capsules contain a proprietary protein derived from a deep-sea fish and antioxidants such as lycopene and vitamin C and grape seed extract. Together, they work through producing an increase of elastin and collagen. In addition, the body’s natural moisturizer, hyaluronic acid, saw an increase as well. Coenzyme Q10, also referred to as CoQ10, is known for improving the overall appearance of skin appearance when consuming about 200mg per day. The antioxidant CoQ10, like vitamin E and vitamin C, assists in skin regeneration. Studies have also shown that CoQ10 can lead to a reduction in the volume of wrinkles and depth of wrinkles when taken for several weeks as a supplement. Taking 1500mg of glucosamine per day is among the best of anti-aging supplements for protecting against sagging skin and fine lines. According to a study published in the Journal of Dermatologic Treatment, glucosamine led to a 34% reduction in visible wrinkles and fine lines. The publication also suggests that when glucosamine is taken as a supplement it can make the skin more effective at healing itself, as well as hydrate skin and reduce wrinkles. If you’re serious about anti-aging, also consider anti-aging medicine. Supplements are only one part of the anti-aging equation. Contact me for an initial consultation. In the end, you will get a customized program to meet your individual needs.